Original books in Urdu have been translated in English for American Muslims with the following features. It should be user friendly.1.Translation with easy understanding using common English words, shorter sentences, shorter paragraphs, and minimum number of Arabic words with easy spelling. 2.All Qur’an and Hadith are described in italics throughout the books with references in bold. This will help a reader to become more careful when s/he reads a Qur’anic sentence or Hadith as compared to general explanation. 3.All Roman translations of Qur’anic sentences are replaced with easy translation from the Noble Qur’an.4.All references are listed at the beginning of the books to adequately show all sources (from Hijri 150 to 1400) mentioned throughout the books, which refer to Qur’an and authentic Hadith. 5. A 2-page table is added at the beginning with alphabetic names of the Qur’anic Suras to easily locate any Sura, Chapter, and Sejda. 6.The sequence of the books is arranged as they are read during collective A’maal. Each book has its own one letter symbol, which is used as a prefix to page numbers. Also the seven letters of the seven books are listed at the bottom of each page to show location of each book. It is easy to locate each book and reader’s pre-selected item. 7.The numbering scheme of each chapter within each book is reorganized to easily locate reader’s need. 8.Thin lines are inserted to show separation of shorter Qur’anic sentences and Hadith. 9.All non-Arabic terms are replaced with Arabic terms, since this book is used universally for Da’wah activities. 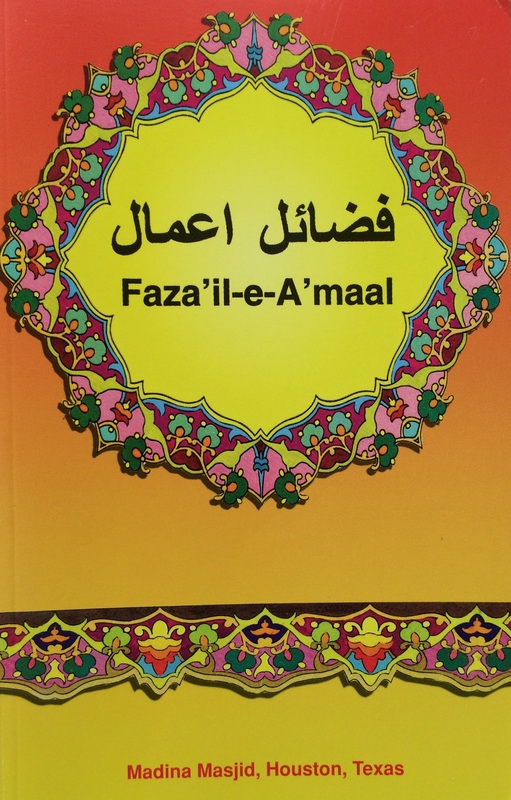 The new Fazail-e-A’maal is only 510 pages and ½ inch thick.